It was a rivalry back in action last night when the New York Rangers visited the New York Islanders at the Nassau Coliseum in Uniondale, New York. It was the third meeting between the two teams during this season so far. The Broadway Blueshirts had a slow start when Michael Grabner of the Islanders got the puck past Rangers goaltender Henrik Lundqvist. But, they brought the score back up to 1-1 in the third period, when center Derek Stepan got a slapshot past Islanders goalie Evgeni Nabakov. 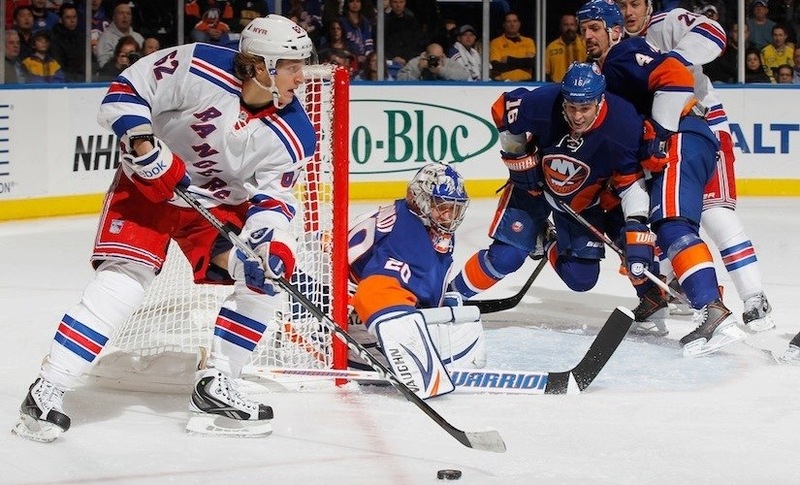 Another slapshot by Marian Gaborik in overtime gave the Rangers their fourth consecutive win. Rangers defenseman Marc Staal has been out of the game since Tuesday, when he got a puck to the face during a game against the Philadelphia Flyers. The injury is putting pressure on the league to make visors mandatory for all NHL players. Tommy Bentze, 12, was also happy to see Rick Nash in action, who the Rangers acquired this season. He said, “It was a very close game. But, I knew Rick Nash was playing great and he would pull through. It was a great game to decide who is the better team!” Nash was a key player in both goals for the Rangers. On the game-tying goal, the puck was deflected off Nash to make it into the net. Nash also assisted the game-winning goal by Gaborik. The Rangers will take on the Islanders just once more during this shortened season on Saturday, April 13 at Nassau Coliseum.